REAL US CANVAS ! New in rolls 6oz treated OD dark green 100% cotton US canvas, wind, flame, water & mildew retardant. Beautiful rare cloth designed for air drop protection & high winds. Sold by the lineal yard (1 x 1.6 yd = 36" x 60"). 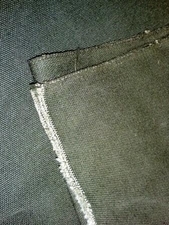 Cloth is cut to length from its original roll.